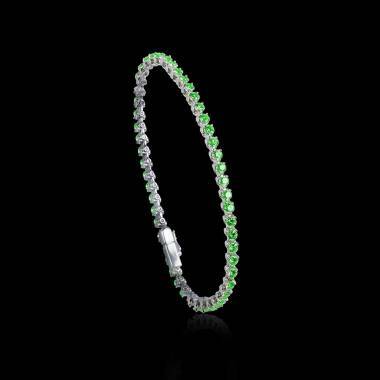 The beauty of an emerald bracelet is dependent on the choice of gemstones that make up the bracelet. The most sought after emeralds are vivid green, similar to the colour of grass with a beautiful shine. You will find additional information on our “Buying emeralds” page in order to select the best emeralds. Emeralds are one of the precious gems along with diamonds, rubies and sapphires. Although they are neither the hardest nor the most expensive gems, their colour makes them quite charming. They are ideal for bracelets to bedazzle your writs. Characterized by their vivid colour and charm, emeralds are also known for being quite fragile. A special cutting called the emerald cut was created to better protect them and increase their resistance. Jaubalet Paris made their specificities an asset in order to provide you with majestically designed emerald bracelets. Taking into consideration an emerald’s characteristics, we have favoured small size gems for our collection. We recommend you do the same for your customized or custom-designed bracelets that you can easily order online.